There are over 4,000 species of cockroaches in the world. At least 30 tie in with human habitats. These 5 types of roaches are the ones most potentially dangerous to you and your kids’ health. Measuring at 1.5 inches long and .25 inches tall, the American cockroach, Periplaneta americana, is the largest of the common roach pests. Adults are reddish brown and have a flat wide oval body. They have long wings and long segmented antennas. The young are similar in appearance, but does not have wings. On average they live up to about two years. It takes roughly 6 to 12 months for a newly hatched nymph to mature into an adult. The female will carry an egg case, called ootheca, around for roughly 2 days before it hides it in a safe location from predators and other dangers. Each ootheca holds around 10 eggs. The eggs are brown in color, purse-shaped and measures about .3 inches long. An egg will hatch within 6 to 8 weeks. One female can produce up to one hundred and fifty roaches in one lifetime. These roaches are naturally omnivores, but will eat things like glue if they have to. They have even been observed eating dead roaches and other roaches that are defenseless from injuries. 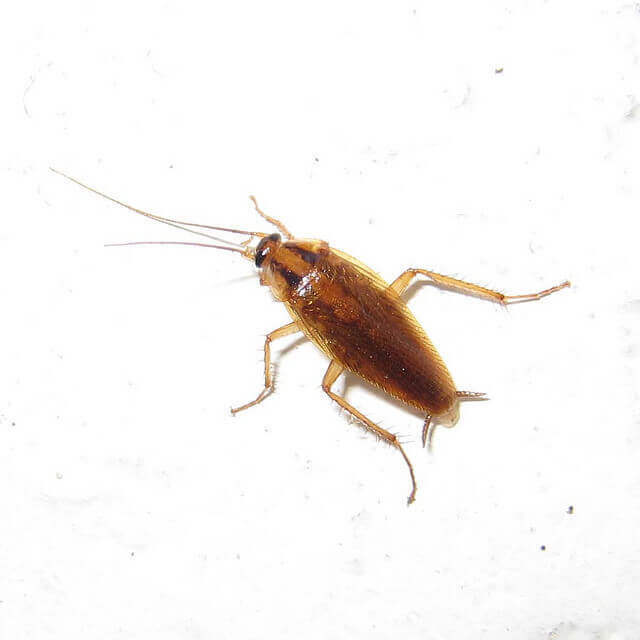 Due to its large size and slow development cycle, large infestations inside the home are not common compared to the other types of roaches. At just .5 inches long, the German cockroach, Blattella germanica, is one of the smaller common roach pests. Coloration can vary between tan, brown, and black. You can differentiate them from the others by the two dark streaks running down from the head to the base of the wings. They reproduce the fastest compared to the other four types. One single ootheca holds up to 50 eggs. The time required for a hatchling to grow into an adult is just 120 days, or 4 months. This short reproduction cycle leads to large scale infestations that seem almost impossible to eradicate. The ootheca starts out a translucent white at first and eventually turns to a chestnut brown color. Unlike the American cockroach, the female German cockroach will carry the egg until it is ready to hatch. The egg case will detach around 24 hours before the eggs hatch. Newly hatched nymphs are black. Their average lifespan is one year. Food preferences include sugars and fats, but will not hesitate to eat other common household items like glue, soap and toothpaste. Check out the other article about what attracts cockroaches for more info. Easily capable of large infestations. This is made possible thanks to their small size, sort development cycle and sheer numbers hatched from one single egg case. Very similar to german roaches. Little over half an inch long. Tan or brown in color. Has wings but longer than German roaches. Can fly. Attracted to light. They are actually capable of flight. They are attracted to light. You will commonly find them during the day. Keep in mind that cockroach sightings during the day indicates a very large infestation. Seeing them in the day could mean it’s an Asian cockroach, but it could also mean you have a serious German cockroach problem on your hands. The brown banded cockroach, supella longipalpa, measure just a little under .5 inches and are reddish brown to dark brown. They possess wings that are darker towards the base of the wings and get lighter further from it. You can tell identify them with the two noticeable bands across their bodies. Though called brown banded, the bands are actually closer to a yellow than a brown. Oothecae (egg cases) are usually deposited in a safe location until the eggs hatch. The average lifespan is about 11 months. They prefer warmer, dryer, and higher places than other roaches. Common places where you might find them include cabinets in bathrooms and kitchens. Oriental cockroaches, Blatta orientalis, are the second largest among these five and measures at almost 1 inches long. They are dark brown to black in color. Females have wings that are shorter than the males. Males are capable of flying short distances. Females have a wider body than the males. Their oothecae are dark brown, but can sometimes be blackish. Each egg case holds up to about 18 eggs. The cases are placed in safe places after mating. They’re usually white at first and then turn light brown and eventually ends up being dark brown, or even black. You won’t find these guys inside too often, but they do like to infest areas like porches and drains. If it’s inside, you’ll likely find them in the basement. The longer you leave them to grow in numbers, the higher the chances they will cause you sickness. If you have any of these five types of roaches, you need to get started at getting rid of them.